Ethiopia Declares Emergency, After New Outburst Of Protests And Violence : The Two-Way One week after a deadly stampede touched off accusations of abuses, Prime Minister Hailemariam Desalegn says the declaration is necessary to protect both property and citizens' lives. In a scene from Sunday, Oct. 2, festival-goers chant slogans against the government during a march in Bishoftu, Ethiopia. A week of violence prompted the country to declare a state of emergency. A week after a deadly stampede brought anti-government protests and violence to a fever pitch, Ethiopia declared a six-month state of emergency Sunday. Prime Minister Hailemariam Desalegn says the declaration is necessary for the government to protect both property and citizens' lives. The stampede struck at a religious festival that also had qualities of a demonstration that was held last Sunday, Oct. 2, in the town of Bishoftu, southeast of Addis Ababa. 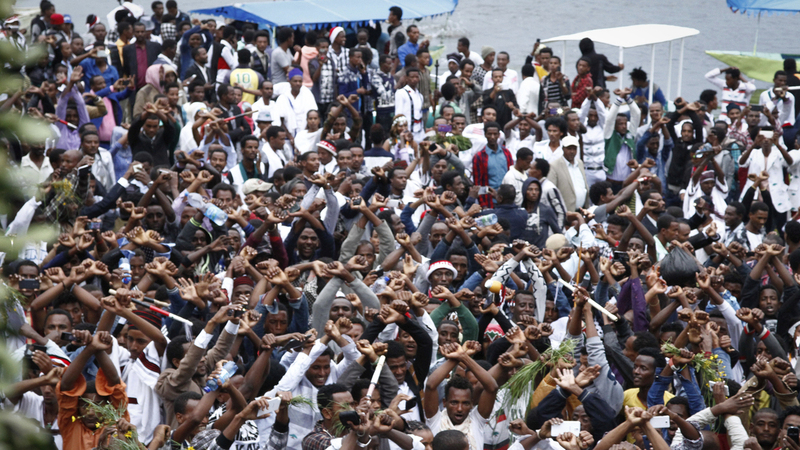 That's where many in a massive crowd that had gathered to celebrate the annual Irreecha thanksgiving festival chanted slogans and crossed their fists over their heads, an increasingly familiar gesture that protests oppression and calls for more rights for the people of Oromia. Video recordings from that day show that the crowd had been pressing toward an open-air stage when security forces opened fire and deployed tear gas, triggering a panic. Many people initially ran to a nearby treeline for cover, only to become trapped in a deep and steep-sided trench. Others were hemmed in by a nearby lake. "The government says 55 people were killed — some fell into nearby gullies and drowned," NPR's Ofeibea Quist-Arcton reports. "The opposition says many, many more people lost their lives." In months of protests in the region, human rights groups say, hundreds of people have been killed and tens of thousands arrested. "Ethiopia's first state of emergency in a quarter century is effective immediately, in the midst of what the government calls a worsening security situation in Oromia. "The Oromo and Amhara people – who make up the majority of Ethiopia's population – argue they're marginalized. They're demanding more political representation, economic power and land rights. "The emergency declaration follows demonstrations against the authorities that have led to deaths and property damage across the Horn of Africa nation – especially in restive Oromia. The U.S. has expressed concern about excessive use of force against demonstrators in months of deadly protests in Ethiopia." The Ethiopian government is "clearly rattled by months of protests by members of the majority Oromo and Amhara communities," Ofeibea says. Today's declaration, she adds, comes amid a clear threat to foreign-owned investments in Ethiopia, as cement, cut flower, textile and fruit juice facilities are among businesses that have come under attack. International rights groups are calling for independent investigations into the events that culminated in last Sunday's stampede. "We call on the protesters to exercise restraint and to renounce the use of violence," said Rupert Colville, spokesperson for the U.N. High Commissioner for Human Rights. "Security forces must conduct themselves in line with international human rights laws and standards." Calling on the government to "urgently change course to prevent more bloodshed," Felix Horne, senior Africa researcher at Human Rights Watch, said, "The world should be carefully watching what is happening in Ethiopia."